We’re all for loading up our kids’ tablets (or uh, the ones they steal from us) with apps that help keep them entertained while hopefully imparting a little more educational value than “how to shoot birds.” Especially as summer creeps closer, and with it, summer road trip plans. The thing is, when it comes to educational apps, our minds tend to go right to math and reading. But educational value can be defined so much more broadly, really opening up myriad ways for our kids to use screens to learn. So as parents who have covered a ton of our favorite educational, entertaining apps for kids on Cool Mom Tech over the years, we’re here to help you unearth some new favorites by sharing educational app categories you might not have considered. And we’re so happy to put together this list on behalf of our newest sponsor Magic Jigsaw Puzzles app, the super popular gaming app that offers more than 20,000 puzzles for all ages and skill levels. In fact, jigsaw puzzles are educational too! Imagine that. Don’t just think of educational reading apps as flash cards (although they can be great too). There are often more fun ways for kids to grasp the concepts of literacy beyond drilling. Hit your favorite app store and search for general word games by level (like sight words for preschoolers), or specific types games like crosswords and jumbles. Bonus: Word game apps are a fantastic way to keep all those synapses firing over the summer, especially if your kids aren’t avid bookworms. Particularly when we’re traveling, we’re big fans of the growing number of journaling apps that allow kids to document their days, record memories of big events, or just spark some creative writing ideas. Today there are so many options, whether you’ve got older kids who can type out their feelings adding their own snapshots, or younger kids who can journal with multiple choice or fill-in-the-blank templates. There’s a reason that jigsaw puzzles have endured for centuries. They’re not only fun, but they actually help kids with cognitive skills, hand-eye coordination, small motor skills, memory, and even the basics of physics as they learn to envision how a puzzle piece fits into the whole. Plus of course, they help kids develop patience, which we as parents looooove. That’s why we’re happy to work with our sponsor Magic Jigsaw Puzzles, which offers literally thousands of different puzzles featuring all kinds of images at all skill levels. Kids will be more inclined to stick with puzzling when they’re excited about the theme, whether it’s sports, art, nature, or images from a favorite movie and you’ll definitely find them all here. Science apps have come a long way from basic quizzes or “name that dinosaur.” Now, you can find a science app that drills down to absolutely any branch that thrills your kid most. Look for astronomy apps to help kids map the current sky; anatomy apps to help kids identify the functions of their own bodies; earth science apps that tap into kids’ natural excitement about exploring the world they live in. Search for apps about mammals, oceanography, you name it. There are also plenty of DIY science experiment and chemistry apps we love — but you should probably save those until you’re out of the car. Ideally, somewhere with running water and a lot of paper towels nearby. Download the hugely popular Magic Jigsaw Puzzles app for more than 20,000 puzzles for kids at all different abilities, including stunning nature photos from National Geographic, and the ability to create puzzles from your own vacation photos! Plenty of puzzles are available for free, while you can upgrade to add special puzzles through in-app purchases giving kids even more opportunity to sharpen their puzzle-solving skills. 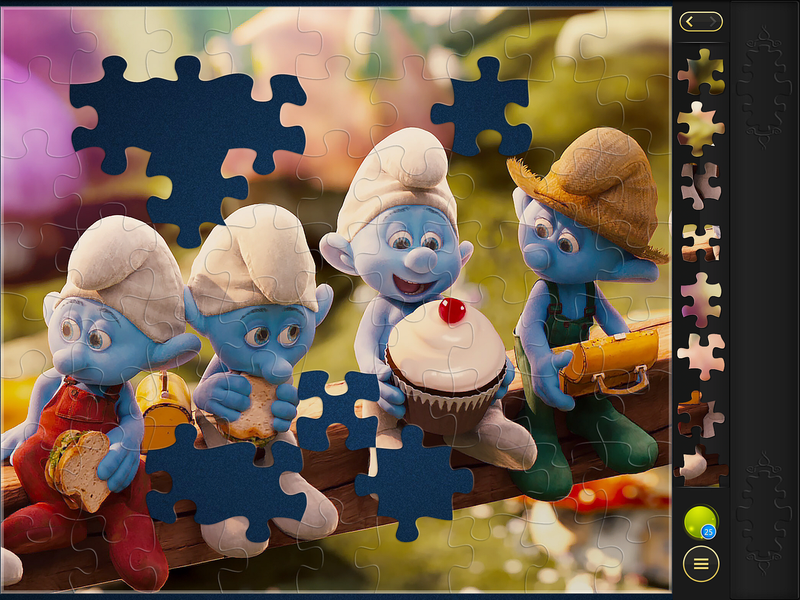 And now, Magic Jigsaw Puzzles offers a collection of new puzzles kids will especially love to solve, because they feature images from favorite Sony Pictures animated films The Smurfs, Cloudy With a Chance of Meatballs, and Hotel Transylvania, with even more titles coming soon. It’s a great way to spend time on a long summer car ride or when you’re stuck indoors on a rainy day. Download now in all major app stores for whatever platform you own or find them on The Magic Puzzles Community Facebook. Or, check out their YouTube video for a run-through. No, we don’t mean streaming music apps (though they have their time and place too). We are always happy when we can set up our kids in the back seat with apps that help them learn the basics of rhythm, tone, and melody — or even get them composing their own music. What’s even better is that there are music app for kids by genre and instrument, whether they’re excited about classical piano or beatboxing. Art education is so essential too for both visual learning, motor skills, and even cultural awareness. There are so many truly outstanding art apps now for all platforms, from paint-by-number and coloring book style art apps for younger kids, to really comprehensive apps to help more skilled children master digital illustration technique. Be sure to search for options with your kids, and you’ll see just what gets them excited. It’s increasingly a bilingual (or trilingual) world and we’re just living in it. Younger children in particular are so perfectly primed for learning a second language. If they loved all of those preschool TV series that introduce kids to other cultures and languages, try finding an age-appropriate foreign language app that excites them, and be amazed as they start naming everyday objects in French, Spanish, Hebrew or Catalan. As so many prominent educators have assured us, any way you get kids to love reading and learning, is a good way to get kids to love reading and learning. If they’re into comics, no need to push them into “appropriate” chapter books. Download some comics they love — or even better, search for any number of highly rated apps that allow kids to create their very own comics. Cool! When we can’t read to our kids (hi, driving up here!) kids can take matters into their own hands with audio books targeted to every interest and reading level. It helps kids maintain focus, and increases vocabulary and comprehension. Hey, you might even be able to get them excited about a whole new genre, especially if a favorite celeb is narrating. Thanks so much to our sponsor Magic Jigsaw Puzzles. Download now from all major app stores, and get access to as many as 20,000 puzzles including the brand new puzzles featuring images from kid-favorite Sony Pictures animated films.